Ghananie.Com: EDITORIAL: Ghana Hits the Golden Age! 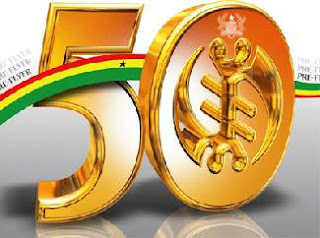 The Land of our Birth, Ghana, to which we all pledge our allegiance, is 50 years old!! Hitting the golden age as a nation is cause for celebrations…merry celebrations. It also calls for reflection, very sober reflection, of the fortunes that the nation has undergone since attaining nationhood.Ghana has undergone a lot of transformation since 1957. It has also undergone a lot of upheavals. In short, the nation has experienced both ups and downs over the past fifty years. From a modest beginning in 1957 with a population of just over five million people and limited infrastructure, a lot has been achieved. Educational opportunities have expanded tremendously. There was only one university at Independence: the University of Ghana at Legon, near Accra, established in the pre-independence days in 1948. Today the country boasts of four large public universities, three university colleges and a number of private university colleges. From the earlier days when students had to travel for miles to attend secondary schools, students now have a wide range of choice of different secondary schools and post-secondary institutions close to their homes and neighborhoods. Roads and other infrastructures have expanded greatly making many hitherto remote areas of the country now accessible.On the political front, the country has emerged from the small unitary Parliamentary system of government inherited from the British colonialists to a vibrant blend of Parliamentary and Presidential system. From a one-party dictatorship instituted by the first government in 1960, the country now boasts of vibrant opposition parties. From days gone by when freedom of expression and freedom of political association were taboos, the practice of which could land one in Preventive Detention, the country and its citizens now boast of and enjoy an unalloyed and unrestricted freedom of expression and association. The principle and practice of the rule of law now reign in the country. From days gone by when there was only one Radio and Television Station, the nation now boasts of over one hundred and thirty radio stations across the country and about four television stations. From the days when there were only two newspapers, the Daily Graphic and Ghanaian Times, there are now an uncountable number of newspapers, most of them privately owned. In short the nation has made a lot of strides on the political, social, legal and economic spheres.On the negative side, the nation has experienced a lot of social and political upheavals. A Preventive Detention Center was built at Nsawam, 22 miles north-east of Accra around 1958 to jail political opponents in the early life of the nation. This institution has been used continuously by governments at various times in the nation's history to incarcerate their political opponents.Military adventurers have also disturbed the political and social order of the county on countless occasions. Over the course of the past fifty years, military interventions have interrupted the political and constitutional order of the nation for as many as six times. The military arrogated unto themselves the power to run the political affairs of the nation for nearly half of the nation's fifty-year life. The result has been a near total destruction of every fabric of the nation's life. Military adventurism led to senseless human rights abuses, total plunder of the nation's wealth and the destruction of the political system.One negative thing that has lingered in the psyche of the nation's citizenry is the negative attitude to work and the wanton disregard of public property. People have not developed any positive attitude to work over the past fifty years. In fact this attitude seems to be getting worse. Nations can only develop if citizens regard public property as their own and take good care of them. Nations also develop if citizens develop positive attitudes to work and ensure higher levels of productivity. In this regard, Ghana as a nation has fared very badly. We can go on and on.Looking back over the past fifty years, however , we can all feel proud as having participated at various times in the nation's life to bring the Land of Our Birth to where it is today…respected among the community of Nations. To all those who have genuinely contributed to the positive development of the nation, we salute them and encourage them to work even harder. To those that have sat on the fence or participated in the destruction of the county at various times in its history, we wish them a change of heart and attitude. The country belongs to us all and no matter which part of the world we have settled and made a second home, GHANA will always be the Land of Our Birth, to which we all pledge our unflinching support and allegiance.Let us all resolve on this joyous occasion to contribute our quota in any way we can to make the country even greater and worth living in for generations to come who will and should celebrate the 100 th anniversary in more grander style.We wish all Ghanaians and supporters of Ghana around the world a very Happy Anniversary.AFENHYIA PA!! !